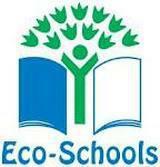 Eco Council will be elected in September to represent and lead our school in becoming more eco friendly! Watch this space to find out who our new representatives are! Well done to all of the following pupils who have been voted by their peers as their classes Eco Council representatives! What an achievement! 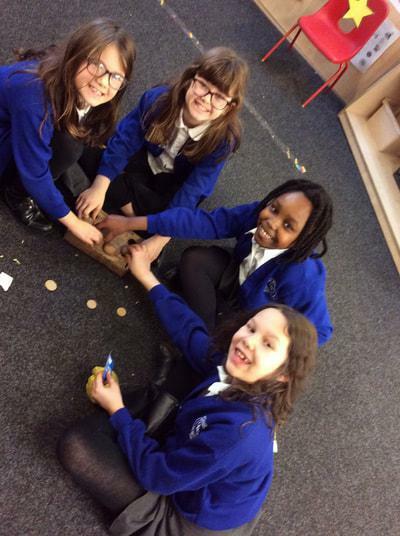 We look forward to you working alongside Mrs Pickup and Mrs Cocker to allow us as school to continue to focus on being Eco Friendly and making the most of our beautiful school grounds. We have been learning all about growing potatoes. We have learnt that another name for potatoes are 'tubers'. Today we have placed our potatoes on a tray for them to sprout. This is called 'chittering'. We will leave them on a windowsill for 2 weeks to chitter. This will help the potatoes to grow bigger and faster. Well done to all our 'Nature Watch' participants! It was lovely to see the nature you spotted over the Christmas holidays! Well done to Sara Janjua who Eco Council chose as the winner. They loved that you used nature to create your nature picture. Seven Trent water came into school to speak with Eco Council about how important it is to save water. We learnt some pretty shocking facts about water! 97% of the water on earth is sea water, which means its salty and we can't drink it. 2% of the water on earth is frozen. 1% of the water on earth is shared between the population to drink, however half of this is polluted! So this means that we are only using half a percent of the worlds water! WOW! However we learnt that a lot of this water we waste for example when we leave the tap running when brushing our teeth, or having long showers, or using the hose pipe to water our plants instead of a watering can. Sometimes there has even been hosepipe bans as water levels are low! 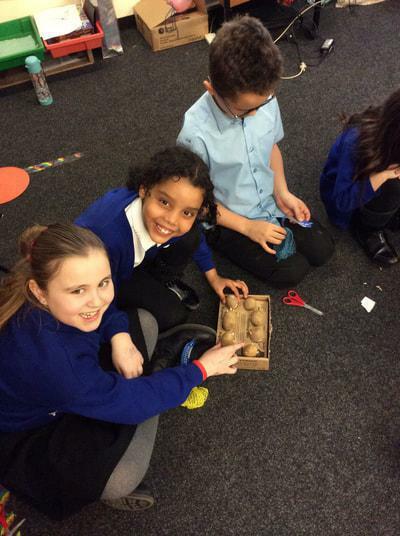 What are Eco Council going to do? We have decided to make posters to put around school in areas where there are taps to remind everyone to turn the taps off. We are also going to remind children not to flush green paper towels down the toilet as this blocks our drains. We helped to deliver the assembly to the rest of school to share how we can all play a part to save water. 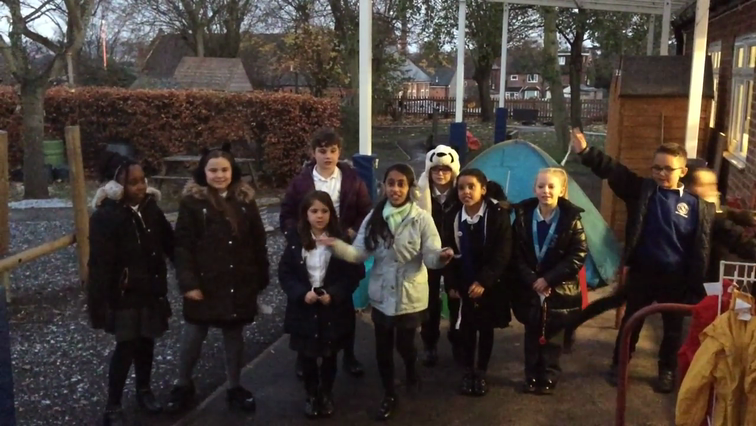 The children from Eco Council would like to present 'Nature Round'. We would like you to take a 'snap shot' of the nature you see when you are out and about. This can be anything from birds, beetles, worms, slugs, snowdrops, the winter sky, scenes of the weather, maybe even the snow! We want to see what nature looks like near you! This might be during your journey to and from school, a trip out to the local park or the nature in your garden! If you have a camera then snap away! If you do not have a camera then draw a picture of the nature you can see. Please make sure your full name and class is on your photo or picture. There will be a 'Nature Watch' post box situated in the school reception area for you to post your entries. A winner will be selected each half term for the picture that catches 'Eco Councils' eyes! Get your nature goggles on! We can't wait to see what you discover! This morning (25.9.17) during whole school assembly, Miss Robins our Outdoor Learning Leader announced the pupils that had been chosen by their peers to be members of our new Old Basford School Eco Council for this academic year. Throughout the year they will all be working hard to help our planet. 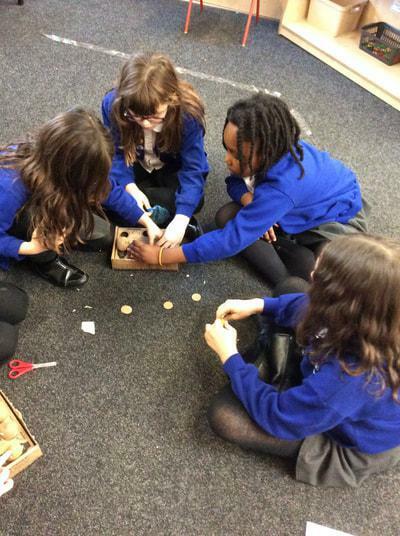 Eco council meet for an hour after school every week. This week the Potato bus arrived at Old Basford. This specially designed bus has come from Branston farm and has been created to teach children all about potatoes. Eco council were the first to spend an afternoon on the bus. We learnt so much! 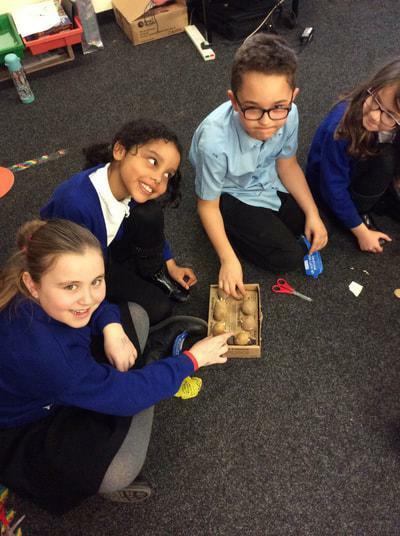 We tasted potato wedges, sized and weighed potatoes, planted and harvested potatoes and much more. A BIG thank you to the staff from Billy Branston's Amazing Potato Factory, we had a great time and learned so much. Look at our new School Pond!!!! Whilst we were all enjoying our summer holidays work was taking place to transform our school pond area. This was all thanks to our fantastic school community who helped us to win a grant, through the Tesco Bags of Help Scheme, which we used to improve our school grounds. As you can see from the photographs below, GroundCover Turf Ltd have worked tirelessly to create us an amazing new pond area which we and all our children will be able to enjoy working in. Huge thanks and well done to GroundCover Turf Ltd for completing the job. We have already been busy making sure that our school is litter free. 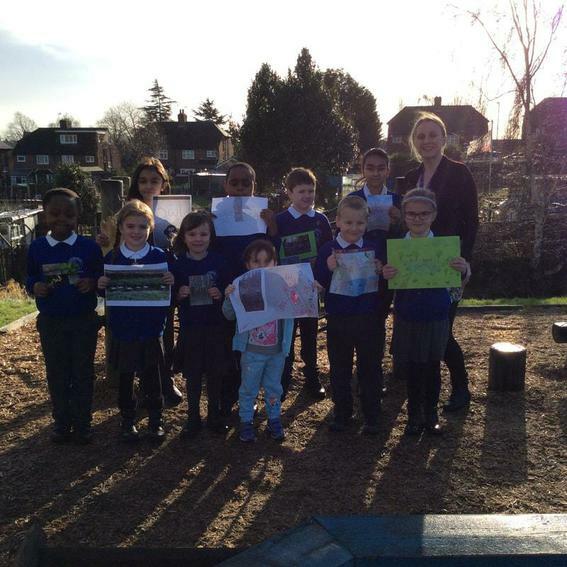 We have also started to think about ways that we could develop a nature trail around our school. Several years ago our Eco Council planted some apple trees. We are very proud to let you know that this year we have had some apples! We look forward to seeing these trees grow over the years and become a beautiful orchard. We are delighted to have EON continue their partnership in the community work with us this November. They visited us on Wednesday and entertained us in two separate assemblies whilst informing us on how and why it is important to save energy and electricity around the home and in school! Enjoy looking at some of our pictures from the day!